Hi from Sunny Sydney! Although it's now officially Autumn we are finally having some summery weather after a lot of rain, hopefully the warm weather will stick around a little bit longer. We've had a very busy few months here in the Sydney office and we'll have some video and audio updates on our events in upcoming blog posts. 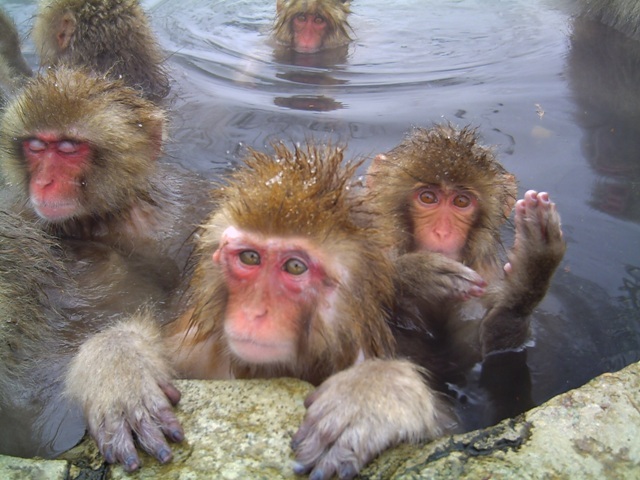 In the meantime I'd like to share with you a new section of our monthly email newsletter Omusubi (to read past issues click here, The Japan Foundation Sydney - Omusubi Newsletter), it's called 'Japan Snapshot' and each month we ask our readers to send in their favourite Japan-related photos. We received some great submissions for March, enjoy! Photo sent in by Andrea (right). 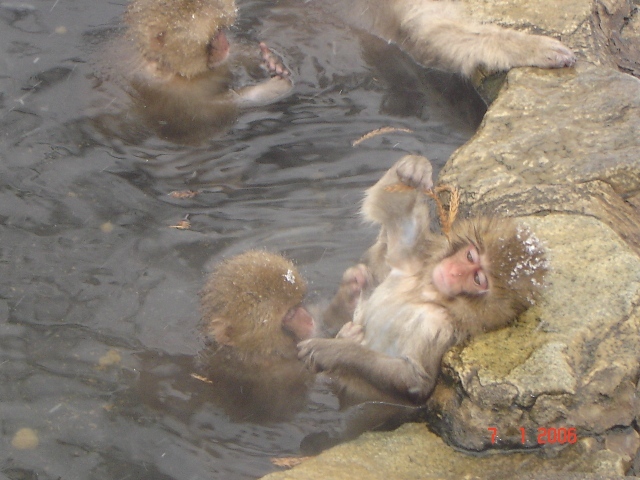 Andrea says, "These are some lovely pics from the Jigokudani Monkey Park in Nagano. They are cheeky and very inquisitive creatures. It was the highlight of one of my trips to Japan". Photo sent in by Leo (left). 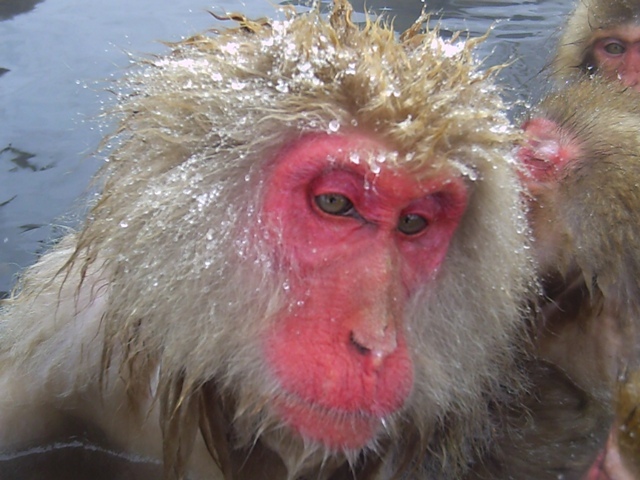 Leo says, "I took the attached photo in Nov 2010 when I was holidaying in Japan. I had found a small shop in Kyoto, I think near Gojo Station, selling origami made objects. 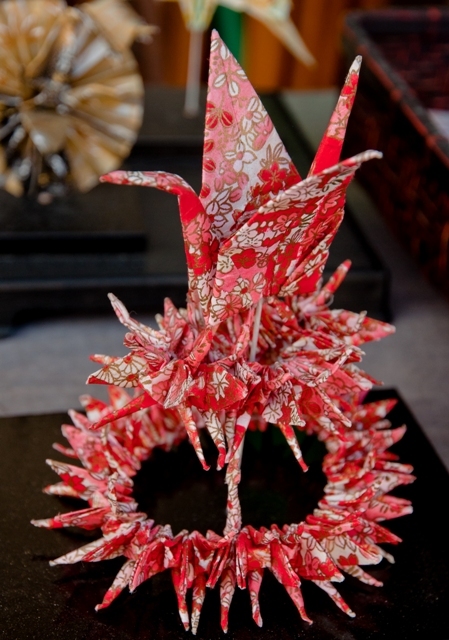 This photo was one of the origami cranes displayed in the shop window". Photo sent in by Peter (right). 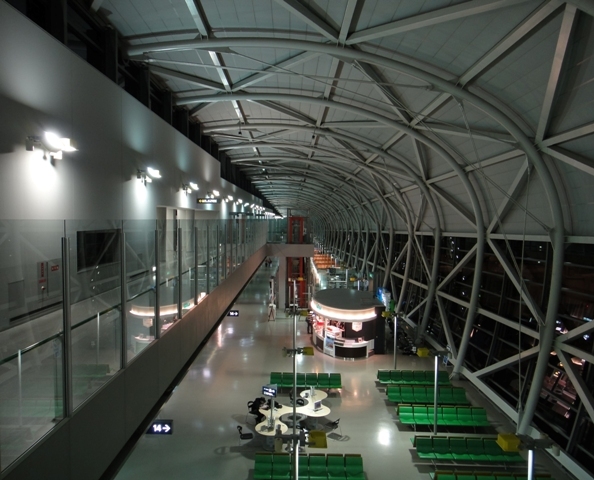 Peter says, "This is a shot of the Renzo Piano designed Kansai Airport at night". Photo sent in by Sarah (left). Sarah says, "This photo was taken on the 8th Jan 2011 near Hokkaido University. 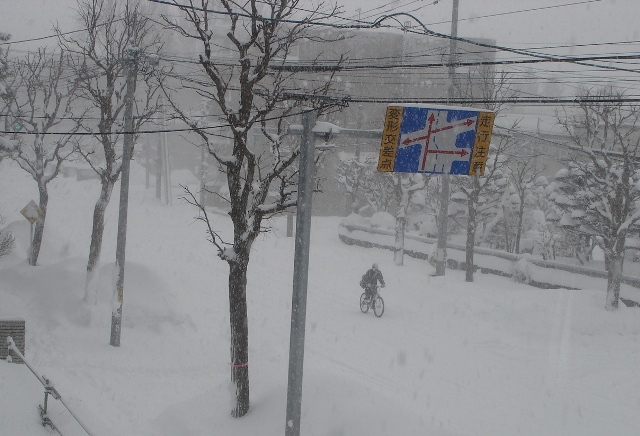 For me it epitomizes the hardiness of Hokkaido-ites!". Peter says, "This shot was taken late last year at a festival in Okayama. 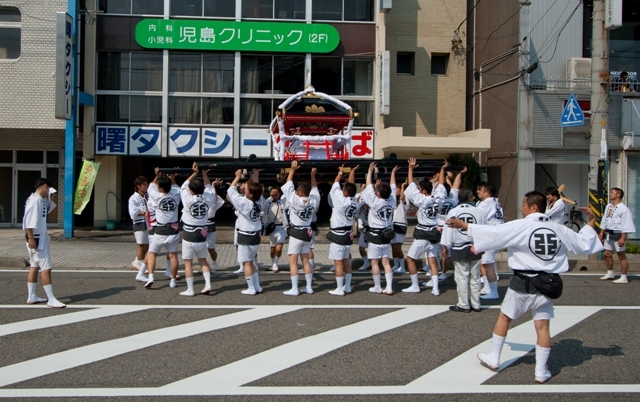 The Mikoshi is being raised in front of the Honjo Hachimangu shrine in Kojima - Okayama". Photo sent in by Daniel (left). 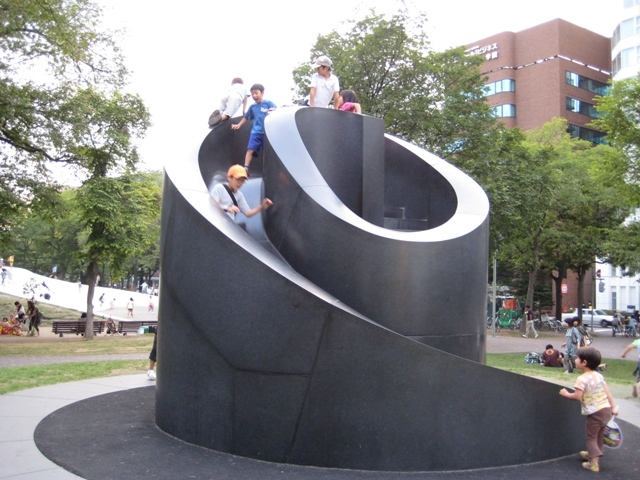 Daniel says, "This photo shows kids having a great time on the slide in Odori Park in central Sapporo. We saw this during our visit, which coincided with a beer festival in the park". Photo sent in by Daniel (right). Daniel says, "This was taken in a restaurant between Shinrin koen Station and the Historical Village of Hokkaido, on the outskirts of Sapporo. We had just finished a wonderful visit to the park, and were hungry, and came across this restaurant. 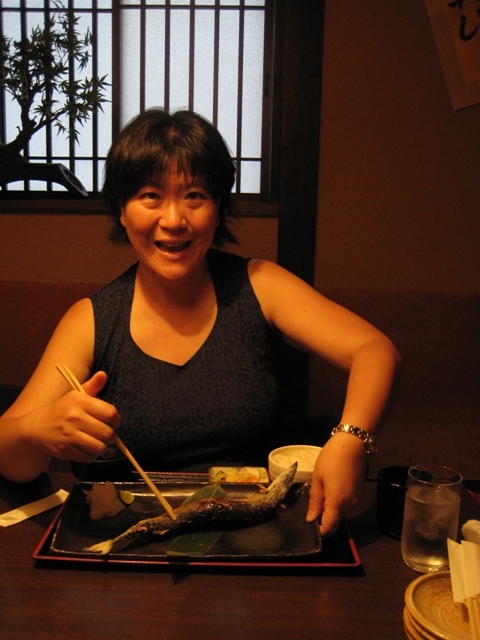 Our Japanese was sorely lacking, but we managed to order some fish, which was fantastic!". Photo sent in by Julie (left). Julie says,“The girl in this picture was standing on one of the main shopping streets in Harajuku, holding a big sign advertising a clothing store. I asked if I could take her photo and she started posing for me. Kawaii!”. 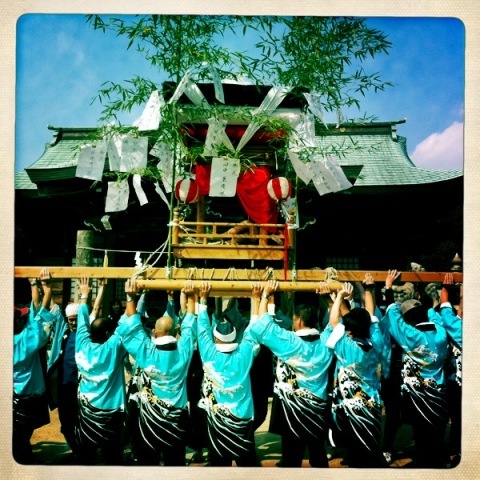 Peter says, "This shot was taken of a Mikoshi at festival time in Kojima". Photo sent in by Paul (left). 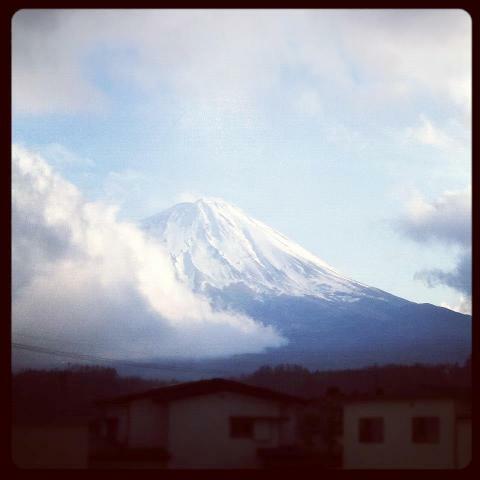 Paul says, "This is a photo from our January 2012 school trip to Japan. Taken in Nara next to Kofukuji. 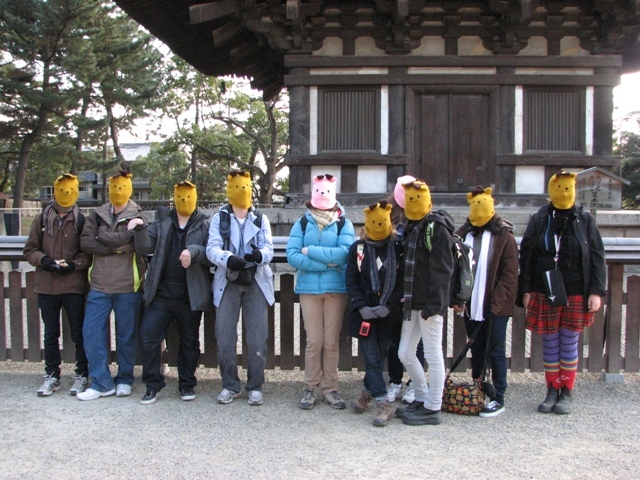 After visiting many of Nara’s sights, the group enjoyed feeding the many hungry deer and then decided to show their unity and connection with the deer by all wearing a Nara Deer hat, but not wearing them in the usual manner!". Photo sent in by Claire (right). 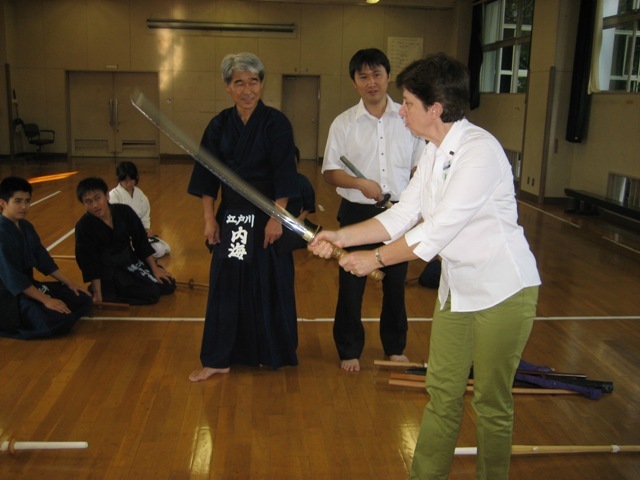 Claire says, "Although I have travelled to Japan four times on holidays my trip to Edogawa in Tokyo was an amazing experience. Our Council has established a Sister City Relationship with Edogawa. The Cultural team developed a program of visits to many places in the city including a junior high school. Our visit to Minami-Kasai Dai Junior high school was a joy for me as my role in the Children’s library means so much contact with young people. The welcome was wonderful with Ogawa san the Principal a friendly face. Ogawa san had been to Gosford in 2009 with the youth wing and spoke with fond memories of his time in our city. Our opportunity to mingle with students at various times including lunch, emergency evacuation training, Ikebana and kendo class was great. The students were so friendly; the noise and laughter in the break was very familiar. Our kendo class was the day’s highlights for me. We were much honoured to receive instructions in both the formal regime and practice fighting techniques by the highest level master. It is rare that a school is able to secure the services of a master with such experience on staff!". Photo sent in by Andrea (left). Photo sent in by Amy (right). Amy says, "First time driving in Japan (in the snow! ), first time to see Mt Fuji up close and to enjoy the naked* hot spring with my friends- this may not be the best shot of Mt Fuji but it was indeed a superb trip! ".